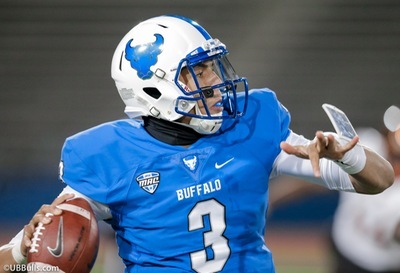 Tyree Jackson broke a team record in UB's win over Delaware State. Frustrating. Encouraging. Narrow defeats. Close losses. One play away. Just one play away. Depending on your perspective about this UB season, all of the above may apply. While the Bulls have made great strides and are competitive every week, they have yet to climb over the hump and that’s led to four single digit losses. It’s been hard seeing them lose six games by a total of 29 points. There are a lot of “what-ifs” in those games. A catch here, a block here, a tackle made, a kick that goes a few feet the other way. That’s the difference between the Bulls current record and a season that is arguably four plays away from 7-2. But despite this, the Bulls are still in position to make a bowl. If they can beat BG (2-7), Ball State (2-7) and Ohio (7-2), they will finish 6-6. That most likely gets UB to a bowl game, which was a goal to start the season. Bull Session Trivia: Bowling Green will start freshman QB Jarret Doege. He’s the first Falcons freshman starting QB since 1982. That player was a 1986 draft pick of the Buffalo Bills, and was a teammate of Jim Kelly & Frank Reich. He also started the infamous 1987 replacement game against Lawrence Taylor and the NY Giants. Can you name him? Tyree Jackson showed patience and pocket-passing ability in his return to the lineup against Akron. Coming off the knee injury, running wasn’t a part of his game plan. So he adjusted his game, and stood tall in the pocket. Tyree’s 50 attempts, 34 completions and 313 yards were all career highs. He consistently moved through his progressions, and that led to five check-down passes to the running backs. Bulls Coach Lance Leipold noticed. He thinks Jackson learned a lot from watching Drew Anderson run the Bulls offense without the big threat of a running QB. Leipold also feels like the time off has made him a better quarterback, and allowed him to mature as a man and a leader…The Bulls offense showed a new effort to get Anthony Johnson free from double coverage. Johnson went in motion a lot. That’s designed to signal the defensive coverage, and also put him in open space. Half of Johnson’s six catches came on bubble screens or quick flares. With his running ability and speed, a simple five-yard pass can easily become a 25-yard completion…Johnson is 112 yards away from becoming the fourth UB player to reach 1000 yards in a season…AJ’s 888 yards receiving rank first in the MAC, and 7th in the NCAA…With all the attention paid to #83, Kamathi Holsey has broken out. He has 16 catches for 310 yards in the last four games, including two 100 yard performances…The Bulls running game finally found a groove, totaling 146 yards against Akron. Emmanuel Reed reached 100 yards for the fourth time this season, but the first time in four games…The Falcons rank at the bottom of the MAC in scoring defense, total defense, run defense and pass defense. But they’re second in takeaways with 13 fumble recoveries and 8 interceptions. That fumble recovery total is #2 in the NCAA. It is a major focus of Coach Mike Jinks, and something they work on in practice every day…Linebacker Brandon Harris has forced three fumbles, and returned one of them for a TD. Free Safety Marcus Milton has three interceptions to rank 4th in the MAC…The Falcons leading tackler is middle linebacker Nate Locke, who had 4 tackles for loss last week against Kent State…BG’s leading cornerback is Cameron Jefferies. He may stay matched up against Johnson no matter where #83 goes…Bowling Green punter Joseph Davidson is a major weapon. He averages 44.6 yards per punt, and half of his kicks have landed inside the 20-yard line. Bulls LB Khalil Hodge was limited to just four tackles against Akron, partly because the Zips didn’t run much and didn’t run up the middle. So he’s now just six tackles away from the UB FBS record of 125, held by Justin Winters…The UB defensive line was especially strong in taking the run away from Akron. DT’s Chris Ford and Justin Brandon continue to be middle-cloggers, and allow Hodge to roam the field making plays…With Cam Lewis out, the Bulls struggled to stop the pass. The cornerback group of Tatum Slack, Devon Russell, Brandon Williams and Roy Baker will be counted on to tighten their coverage and cut down on the big plays… An increased pass rush would help. The Bulls have only four sacks in the last four games…The Bulls still rank 3rd in the MAC in pass defense, giving up less than 200 yards per game…This week, the run defense will be tested by Bowling Green. The Falcons have averaged 220 yards on the ground in the last five games. The big reason why is freshman RB Andrew Clair. He’s topped 100 yards in four straight, and now ranks 4th in the MAC with 565 yards. 488 of those yards have come during the last four games…Starting RB Josh Cleveland, a senior, has 564 yards rushing…Last year, Bowling Green ran for 346 yards against UB in the season finale…Running could be a challenge due to significant injuries on the Falcons offensive line. Two players are out, and two other linemen are doubtful, including veteran center Tim McAuliffe. BG may have to play a few freshmen at the guard positions…Left tackle Ryan Hunter is healthy, and has started all nine games. He played at Canisius High School in Buffalo…Freshman QB Doege will make his fourth start of the season. He enrolled early and took part in spring practice, so that’s helped his transition. The Lubbock, Texas native was a high-level player in the pass-happy Lone Star State…Doege’s brother Seth is the Falcons receivers coach, and a former star quarterback at Texas Tech…His top receivers are Scott Miller and Teo Redding. Miller was 1st team All-MAC last season…In conference play, the Falcons are 20/20 in the red zone. 12 of those scores were field goals by kicker Jake Suder, who has made all of his 14 kicks inside 40 yards. 2440 yards. 15 touchdowns. 5 interceptions. Those are the Bulls passing stats for this season. If that had been one quarterback, instead of the three that have played, it would rank second in the MAC in yards and third in touchdowns. The fact that the Bulls have played three quarterbacks, including two who had never played, is a tribute to the preparation and instruction of the coaching staff. Offensive coordinator Andy Kotelnicki and QB Coach Jim Zebrowski have had to work hard this season, and make adjustments for Jackson, Anderson and Vantrease. Leipold singled out both, and noted that Zebrowski “loves coaching quarterbacks.” Both Zebrowski and Leipold are former college quarterbacks, and that has helped them get each signalcaller ready. In a year when the MAC has had an epidemic of quarterback injuries, the Bulls may not have been healthy but have had healthy results. Bull Session Trivia Answer: This was a tough one, and really tested your Bills memory. Brian McClure was the Falcons quarterback who started for four years. He was Buffalo’s 12th round draft pick in 1986.